This year, the most scrumptious mountain initiative of the summer is all about the colours of the rainbow which feature in the dishes created by some of the finest Michelin-star chefs Italy has to offer. Peaks of Gastronomy is calling all foodies with a series of initiatives which unite an outdoors lifestyle with the pleasures of good food in the heart of the Dolomites UNESCO World Heritage. The ninth edition of ‘Peaks of Gastronomy’ puts the colours of the products used in the recipes at centre stage. It is known that the colours of the food we eat ever day impact on the well-being of our body and mind. Green vegetables, such as asparagus, broccoli, artichokes or green beans contain p.es. chlorophyll, fibre and calcium and lower the levels of cholesterol and blood pressure. Orange and yellow produce, such as oranges, carrots, lemons and pumpkin, contain beta-carotene, potassium and vitamin C, and are therefore suitable for the formation of collagen and maintaining the well-being of the joints. If we feel full of creativity and are working on a new project, then we’ll aim for dishes in which blue and purple are the predominant colours; these naturally belong to blueberries, aubergines or red cabbage. When we need to move or stimulate our nervous system, we need red-coloured food, like tomatoes, red peppers, rhubarb or strawberries. 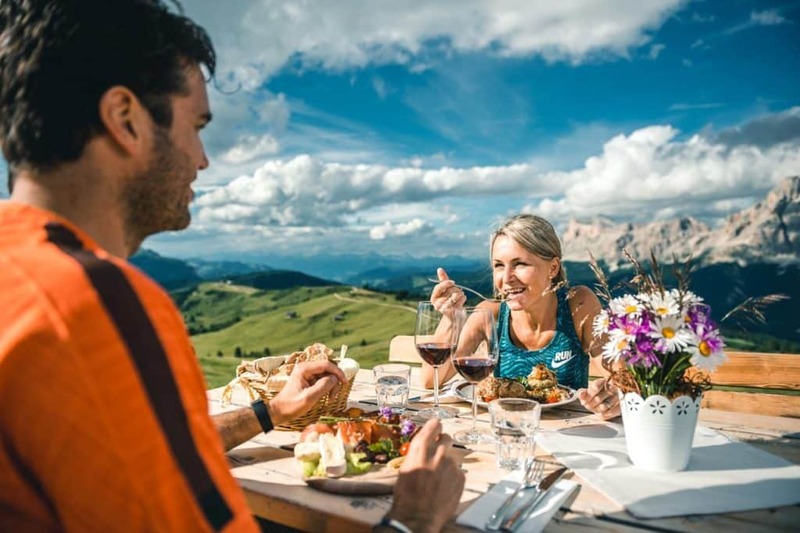 The ‘Peaks of Gastronomy’ formula remains the same: eight Michelin-star chefs create a dish for eight mountain huts along the trails of Alta Badia. Each participating chef is assigned a colour, which is the one which features predominantly in their special dish. Hikers will be taken aback both by the wonderful taste of the gourmet dish, but also by the variety of colours, which transform this food and wine experience also into a feast for the eyes.